The key to harnessing the powerful potential of an AXYS speaker system is the dedicated WinControl software – a highly developed, yet intuitive environment through which the system designer can access and set all functions and parameters. 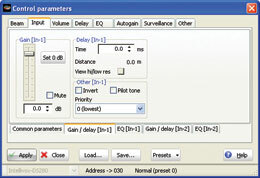 WinControl has been developed for use with AXYS Intellivox, as well as Target, G2 products (Source and Scope ranges), the PB series of amplifiers and the recently released AXYS Octadrive DSP – a high performance line driver that can be used to interface between 3rd-party systems and AXYS products. 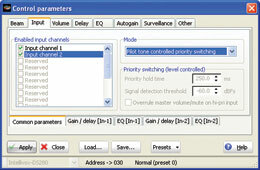 This enables WinControl to provide system-wide status monitoring, even across products from different manufacturers. As the name implies, the WinControl software runs on most varieties of Windows® OS on a standard PC. Communication is via RS-485, with the settings stored in non-volatile memory in the Intellivox units themselves, meaning the PC can be removed at the end of the process. AXYS WinControl directly controls DDC-driven products, and enables the upload of DDA-calculated DDS directivity files. It is also used to define other audio parameters that are critical to achieving the full capabilities of an installation within a specific acoustic space. In short, it is WinControl that enables coherent, intelligable sound to be delivered to the areas where it is required, while steering it away from reflective surfaces that would cause unwanted reverberation. Despite the extent and precision of control offered by WinControl, the in-house software development team has ensured that the user interface can be readily understood. Typically, parameters can be adjusted numerically, or scrolled up and down, with confirmation of the changes displayed graphically in real-time. Once the units have been configured, the PC can be removed from the network as the settings are stored in non volatile memory. 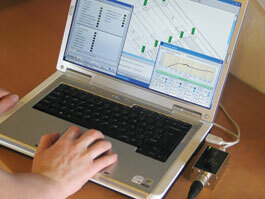 The latest version of AXYS WinControl is available for immediate use or evaluation. Existing users are advised to check from time-to-time that they are running the most recent WinControl release.